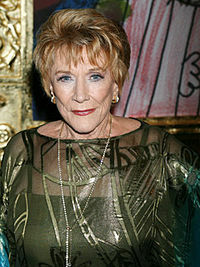 Katherine Chancellor is the matriarch of Genoa City. Many residents seek counsel from Katherine, as she has been through just about everything over the years both in business and her personal life. From marriage to divorce, from friends to enemies, Katherine has seen it all. Katherine's feud with Jill Fenmore has lasted for decades. They started out as friends, became mortal enemies when Jill had an affair with Katherine's husband, Phillip Chancellor II, briefly thought they were mother and daughter, and finally came full circle to friendship, though they still drive each other crazy. Katherine has a son, Brock, and granddaughter, Mackenzie. When she was younger, Katherine had another child but gave it up. It was thought that this child was a girl, and Liz Foster claimed it was Jill. Later, DNA tests proved that Katherine was not Jill's mother. The child Katherine gave up wasn't even a girl. It was a boy who showed up in Genoa City full of lust for revenge. Tucker McCall seduced Jill before announcing his true identity. He gave Katherine a lot of trouble before realizing he actually did want a relationship with his biological mother. He left the country abruptly before that could happen. Through Tucker, Katherine has a grandson, Devon Hamilton. In her lifetime, Katherine has been kidnapped more than once and tricked into believing she was someone else. The last time she lost her memory, she met the man who would later become her husband, Murphy. Murphy stands by Katherine no matter what and comes to her aid if someone has an unkind word to say. Even with all the drama and chaos of Katherine's family and friends, Murphy seems to hold his own. He even got Katherine to go fishing with him. Everything she's experienced has made Katherine tough as nails. She doesn't even have a problem telling God what to do (or else! ), but as long as someone in Genoa City needs advice, she'll be there.